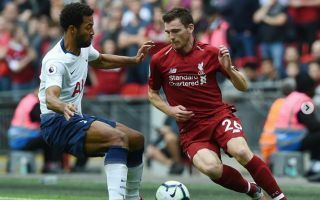 Liverpool left-back Andrew Robertson has sent a message to the club’s fans thanking them for their support in today’s win away to Tottenham. The Scotland international is now looking ahead to the Reds’ huge game in the Champions League on Tuesday against Paris Saint-Germain. Robertson took to social media after today’s win at Wembley to send a message saying the support was brilliant in this big away win and that he’s now focused on another big result against PSG. Liverpool have won five games out of five in the Premier League so can take plenty of confidence into their next match as they look to topple one of the favourites for the Champions League. Robertson should have a key role to play after his remarkable rise since moving to Anfield last season.